Benjamin Bunn was an inventive sort. A teenager who liked to experiment until something came out right. And it did! By 1907 Benjamin H. Bunn had invented a prototype of the world’s original “Automatic Package Tying Machine” – the number One Bunn. This concept actually ushered in the era of automatic packaging. During his first year at the University of Illinois, Benjamin worked on the prototype in the attic of the family home at 10549 Church Street. Benjamin Left school after a year to continue working on his machine’s features and improvements. By 1910 his prize prototype was fully perfected. This is a picture of Ben’s basement on Church Street. He then went on the road to demonstrate the new machine in Post Offices at New York, Washington, and Ottawa, Canada. 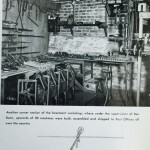 Interestingly, the first Bunn Tying Machine was purchased by the Canadian Post Office. In 1913, the United States Post Office purchased 50 of the new machines, as well as a number of commercial business sales. The Automatic Tying Machine was on its way. 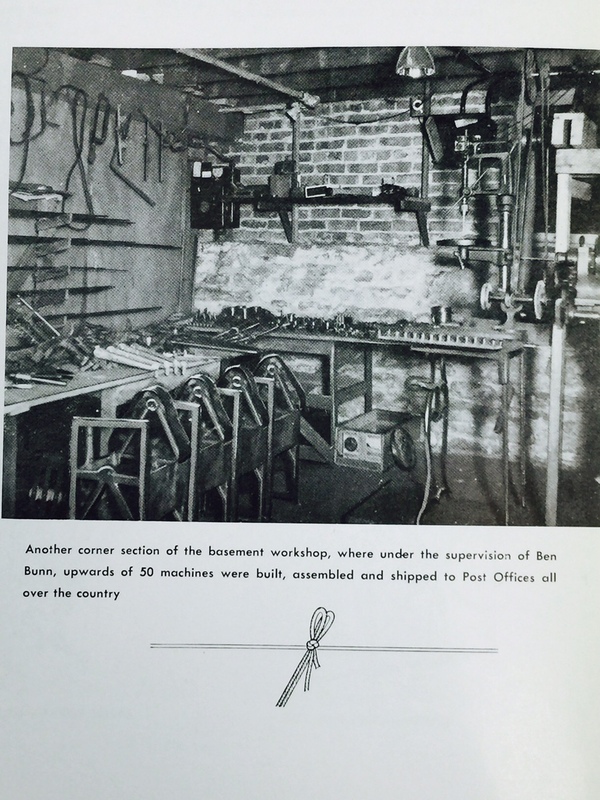 In 1923, with a lot of foresight, optimism and confidence in the future, Benjamin H. Bunn purchased a building at 7339 Vincennes Avenue on Chicago’s south side and established a complete machine shop and assembly area to handle the mounting orders for the Bunn Tying Machines. Commercial industry had beat a path to Bunn requiring all shapes and sizes of machines for general applications. 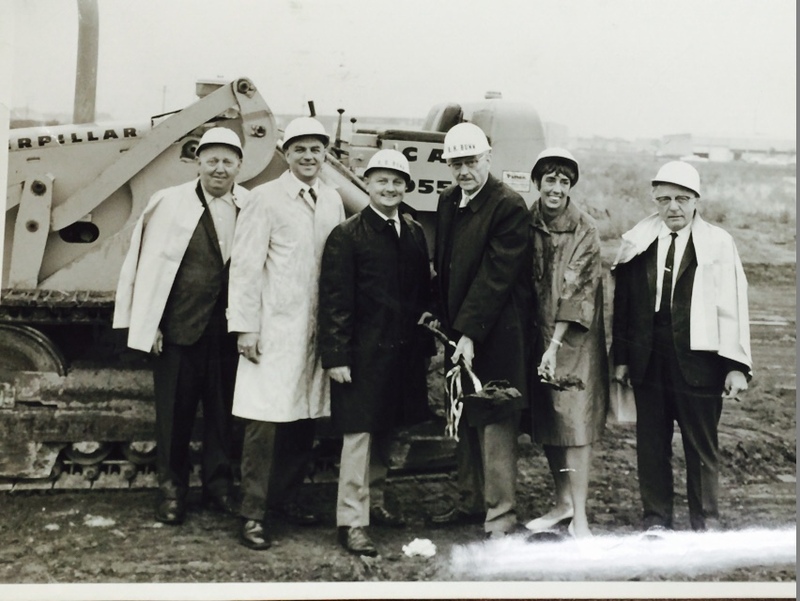 By 1930, the Bunn facility had grown and a new, larger building was built on the Vincennes Avenue site, and 12 years later an addition was made to the facility. The company’s product demand and financial strength continued to grow, and the same thing happened in 1952 and 1957…more additions. In 1946, Benjamin’s son Richard B. Bunn entered the business with an energetic sales approach. From that point, an experienced organization of manufacturing representatives, totaling 25, was pulled together and strengthened nationwide, along with several sales worldwide. 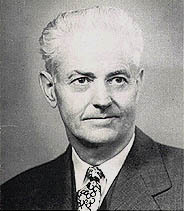 In 1950, a representative of the U.S. Postal Service Research and Development Department, came to the company to request a machine that would be the first step to automated mail. And, it was. Within the next 14 years, 11,000 Bunn tyers were in place in U.S. Post Offices throughout the country. 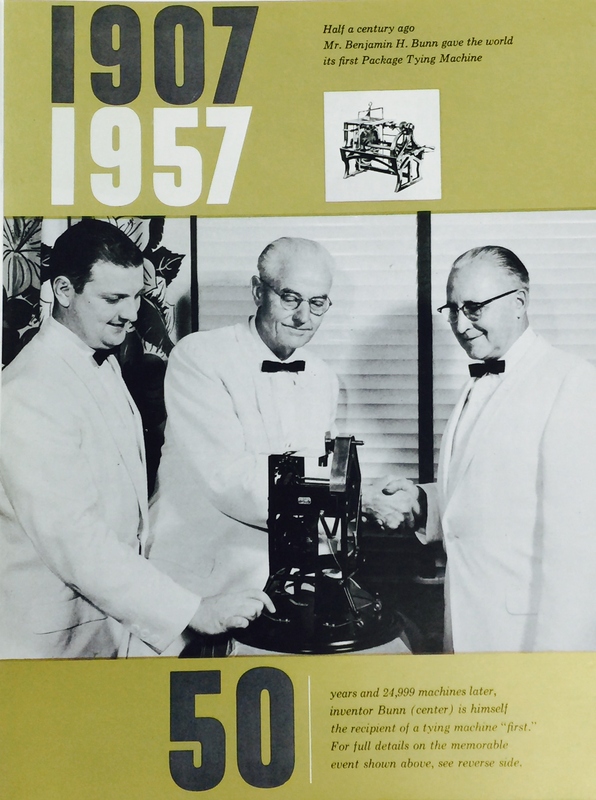 In 1957, Bunn reached another historical date, our 50th year of manufacturing Bunn Tying Machines. Half a century ago, Mr. Benjamin H. Bunn gave the world its first Package Tying Machine. 50 years and 24,999 machines later, inventor Bunn (centered) is himself the recipient of a tying machine “first”. A mixture of happiness and surprise registers on the face of Mr. Benjamin H. Bunn, inventor of the Bunn Package Tying Machine, as he receives a miniature gold-plated machine commemorating the 5oth Anniversary of his invention. Presenting the gift are: Richard B. Bunn (left), Vise President of the Bunn organization, and Plant Superintendent Doug Gregory (right). In 1965, anticipating the needs of industry, Bunn tested a Japanese plastic strap machine. After several years of negotiations and product feature modifications at Bunn’s request, the Nichiro line of plastic strap machines were improved significantly. In 1968, Bunn became one of 4 exclusive North American marketers for plastic strap machines. Business continued to boom and Bunn moved to a spacious plant in south suburban Alsip, Illinois, a 52,000 square foot building on a 5 acre tract that boasted 30% more production space. In 1983, The B. H. Bunn Company marked its 75th Anniversary. Three-quarters century of business growth has made the Bunn name synonymous with package-closing equipment. With combined input from thousands of users in all phases of business, research and development, the Bunn Company can offer a complete range of tying and strapping equipment, along with accessories for virtually any bundling or unitizing application…for maximum productivity. In 1984, B. H. Bunn Company moved again – to Lakeland, Florida. The plant’s new equipment and facility resulted in dramatic savings in machining time and cost efficiency. In 1989, the development process of John R. Bunn, the new Bunn Models created a stronger and more reliable tying machine frame system than the old cast iron frames while keeping the simplicity in the designs. In 1997, after a short leave of absent, John R. Bunn, President, grandson of the inventor, purchased the B. H. Bunn Company from Richard Bunn to continue the family tradition. Since his return, the Bunn company has continued to grow with new designs and applications exceeding customer expectations. In 2000, the Next Generation of Bunn, Ring Tyer, machine was introduced with great strides in the market place. This newest model gives Bunn another dimensions to help customers with precision bundling far surpassing other models. In 2001, Bunn Introduces Stronger Twines. The US Postal System was experiencing an extreme amount of bundle failures due to rubber bands and plastic products. Bunn got involved again with the USPS Package Integrity Testing which showed that poor over used rubber bands, loose strapping on bundles and customers using improper twine was effecting the USPS bottom line. This new stronger Bunn Twine out performed all other method of bundling so well that, Bunn 10PLY Twine is now the Official Twine Specifications as listed in the Domestic Mail Manual for Bundled mail. In 2004, Bunn has introduced the BUNN-LER Stretch wrapping machine. This new Stretch Wrap Model takes the roll out of the customers hand and increases efficiency of bundling with stretch films. In 2006, Bunn has introduced BUNN-Clear-Ty – USPS Approved to meet the USPS Address Visibility issue. By redesigning the tying machine frame, we are now the only tying machine able to convert between most tying materials with minimum conversion time. IN TYING MACHINES – Bunn manufactures an array of models of envelope, package, carton, meat roll tyers, along with custom units all with exclusive, patented features. IN STRETCH MACHINES – Bunn manufactures an array of models to meet the needs and wants of our customers just like the models in tying machines. IN STRAPPING MACHINES – Units which utilize rugged polypropylene strap, offer a long list of features. These include a heat seal as strong as the tensile strength of the plastic strap itself. IN MACHINE GRADE STRAP – Bunn provides material that exceeds industry quality standards and is guaranteed for high-speed machine performance. IN SALES AND SERVICE – Equally important, today the Bunn Company is fortunate to have a distributor organization that is highly sophisticated, knowledgeable and service oriented. With the industry’s largest network of Worldwide Sales, you can be assured quality service, whenever and wherever you need it. Their experience and expertise is second to none. At the Bunn Company, the last 108 years have simply been a prologue to many and varied opportunities within the package-closing industry in the current decade. Bunn’s reputation for quality products has not been exceeded by anyone. And it all started in 1906 with the encouraging notion of a postal clerk.